The musical freight train that is My Favorite Robot Records rolls on, picking up Anglo/French producer Tim Paris for some stripped electronic house music, backed with a remix from Hiem. Tim Paris has been around in dance music circles for some time now, cutting his DJ teeth on the Parisian club scene alongside the likes of Chloe, Ivan Smagghe and Alex Kid before helping set up the acclaimed Crack & Speed label with Jef K and later his own Marketing imprint after relocating to London. As well as recording for his own labels he has released on Ralph Lawson’s 20:20 Vision and Tiefschwarz’s Souvenir and remixed for the likes of Ewan Pearson, Phonique, Lindstrom. 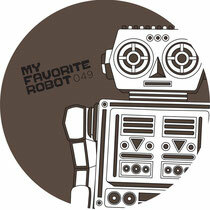 Now Paris has chosen to team up with one of the most exciting labels of recent years, the Toronto based My Favorite Robot Records. The ‘Persisting Practices EP’ kicks off with the epic ‘Submission’, a nine and a half minute journey into the outer realms of electronic house music, built around tight rhythms and understated melodic elements. Following this is ‘Dominance’, an intense brooding track with an edgy late night feel to it and twisted arpeggiated riffs that draw you in. The package is completed by a remix of ‘Dominance’ by the ever-excellent duo of Hiem who have previously recorded for Tim’s Marketing label as well as imprints such as Crosstown Rebels and Eskimo. For this mix they provide a bumping, bass driven workout that weaves elements of house, electro and techno to great effect. Out 26th March.